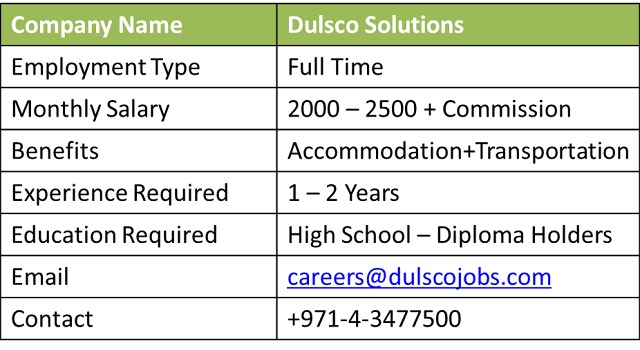 Walk-In Interview in Dulsco HR Solution, Dubai for Limousine Light Vehicle Driver. Interview will be held on Friday 22nd July 2016 from 9.00 am to 2.00 pm at our Main Office Located in AL QUOZ, Industrial Area 4. 2-3 years driving experience in UAE. Pleasing personality with good communication skills in English. Willingness to work in shifts & travel across UAE. Note: Candidates with experience as Taxi Drivers will be given preference. Starting Salary will be above 2000 AED with Commission. Note: Candidates who have miss Interview or unable to reach can send their updated CV's at below Email Address with Passport Size Photograph.